Anyone under 16 can come in to take part between 2 and 6, (Hosted by the talented Jordan Stewart Music) and anyone over the age of 18 (or if you are over 14 you are welcome too, as long as you are accompanied by an adult!) 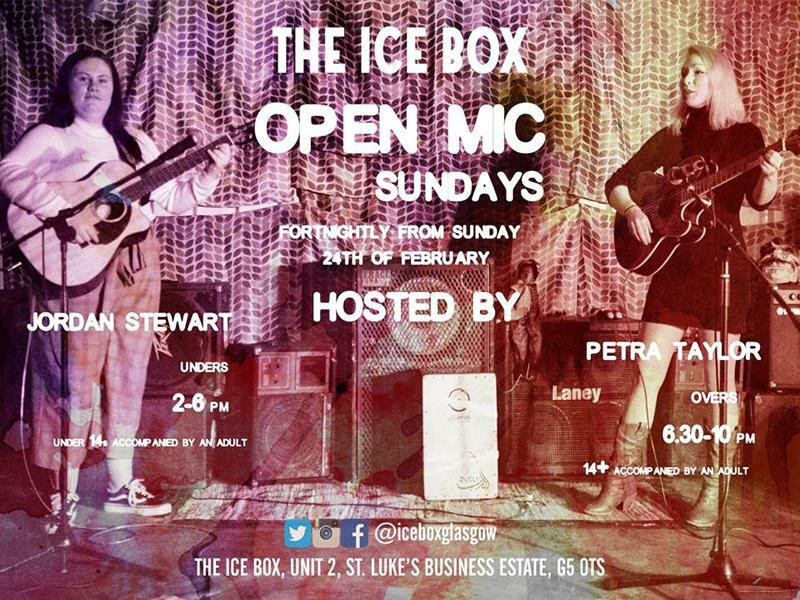 can pop in after 6 for a shot at the open mic overs, hosted by the amazing Petra Taylor! The venue is BYOB with corkage if you fancy a tipple, and we also have plenty of sweets and snacks available, as well as juice, tea, and coffee at our serving area, and there is a selection of games to keep folk happy too! So come on down to Glasgow's newest venue and say hi! Oh, and we are very much a pet friendly venue too, so bring yer dog! While we take every opportunity to ensure the details for The Ice Box Unders And Overs Open Mic Sundays are accurate, we always advise that you contact the event organiser before setting out for the event to avoid disapointment.